Toulon fly-half Jonny Wilkinson is unsure if he will be fit to face Munster in the Heineken Cup semi-finals in three weeks' time. The World Cup-winning former England fly-half, 34, pulled up with a hamstring problem in the first half of the 29-14 win over Leinster on Sunday. "I've had this for the past two weeks and felt it immediately when I went to kick in the 28th minute," he said. "I'll take it day-by-day and hour-by-hour as I would love to play Munster." If Wilkinson, who is expected to retire at the end of the season, is not fit to play against Munster, it may be that he will join Leinster's former Ireland captain Brian O'Driscoll, 35, in playing his final European game on Sunday. 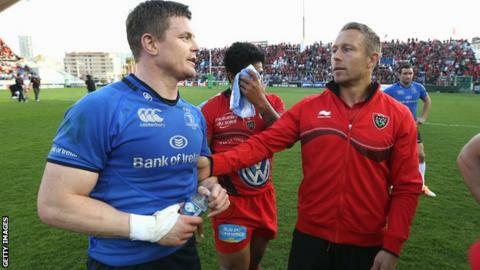 Defending champions Toulon had too much class and power for Leinster and the defeat means O'Driscoll's bid to add the Heineken Cup to the Six Nations title he won with Ireland before retiring at the end of the campaign is over. Wilkinson, a former Lions team-mate and a frequent opponent of O'Driscoll, said the Irishman's impending retirement was "a sad moment for the sport, but I also respect his decision as he leaves at the top". For his part, O'Driscoll said: "We just didn't play well. It was 6-6 at half-time but we didn't come out and play. We made too many mistakes and too many turnovers."